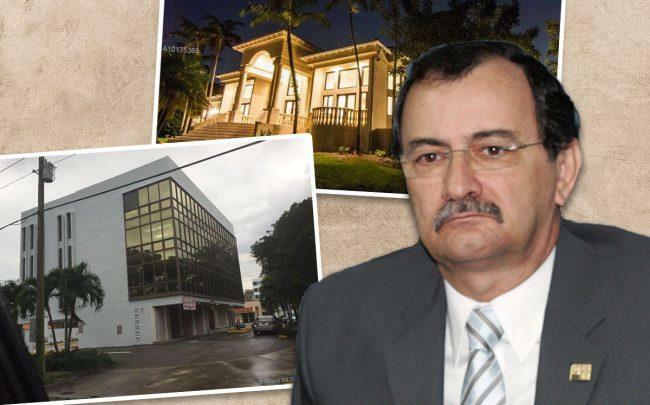 As South Florida real estate has long served as a place for wealthy Latin Americans to park their money, an investigation reveals the family of a disgraced former Ecuadorian official, Carlos Polit, has ties to three Miami area properties. Polit was given a six-year prison sentence last year for collecting a bribe from the Brazilian construction firm Odebrecht, while his son John was given three years for being an accomplice, the Miami Herald reported. Carlos Polit fled to Miami and was named a fugitive by Ecuador in June 2017, but his son has gone back and forth between Miami and Ecuador, according to the Herald. Prosectors in Ecuador alleged that Carlos Polit, who held the position of Ecuador’s top auditor, solicited a $10.1 million bribe from the construction company Odebrecht. The bribe was part of a larger bribery scandal for Odebrecht, which allegedly paid Brazilian and Ecuadorian government officials in exchange for government contracts. All the Miami real estate purchases were made by cash in the names of limited liability companies prior to Carlos Polit’s sentencing, but the Herald reported that mortgages were signed by John Polit. –8112 Los Pinos Circle: a home in Coral Gables, purchased for $3.4 million in February 2016. –1830 Coral Way: A small office building, bought for $1.8 million in 2013. –1902 Southwest 22nd Street: An office building near downtown Miami, purchased for $2.67 million in June 2016. Late last year, a number of wealthy Venezuelans were charged by federal officials of laundering money from the country’s state oil company into luxury real estate in South Florida, including two properties in Dezer Development’s Porsche Design Tower in Sunny Isles Beach.